Some marketers are calling 2011 “The Year of the QR Code”, predicting that mobile tagging will become mainstream. Those little black and white tags are popping up everywhere: in billboards, magazine ads, and even tombstones. QR (or quick response) codes carry the potential of connecting the offline world to the online world, giving a call to action to just about anything. And they use technology that is now in everyone’s pockets. 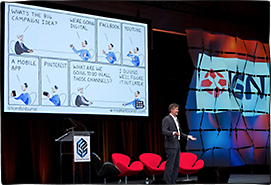 Yet, as with any new technology, QR codes are merely a means to an end for marketers. They are enablers to big ideas. They aren’t the big ideas themselves. Some brands are merely riding the novelty of QR codes, rather than doing anything interesting with them. Brands need to give a reason for consumers to go through the trouble of scanning a mobile tag and exploring whatever destination the brand has in mind. I like how New York City’s Central Park created a rich experience with QR code tagging. The following video clip shows how they linked famous TV show and movie footage to the very spot where watchers are standing (“Walk the Mall with Carrie Bradshaw”). Any call to action has to be meaningful to the consumers, not just to the brand. It may be easier than ever to give consumers an extended brand experience. But it’s also easier than ever for consumers to ignore you. 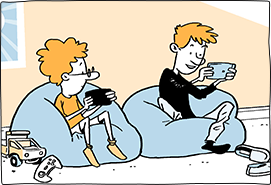 (Oh, in case you’re curious, the QR code in this cartoon is actually a live link back to this post. I’m interested to see if anyone who reads my cartoons in magazines uses it to find their way here). It’s great to find someone who shares the same sentiment as me, insofar where QR codes are concerned. I absolutely agree that “some brands are merely riding the novelty of QR codes, rather than doing anything interesting with them.” While we can’t deny that there are some truly fabulous marketing ideas linked to these codes, the reality is, most businesses seem to be jumping on the bandwagon simply to show they’ve adopted this new way of promoting their brand name. The point is, if I have to whip out my mobile phone to do a code capture, it had better be well worth the effort. Imagine how unimpressed the respondent must feel if he receives a connecting link that is easily available on any of the brand’s existing communications such as magazines, newspapers or street posters. When it’s not the business owner but the customer who needs to go the extra mile, make very sure that the reward is something that has a ‘circulation value’, something that makes the customer excited enough to talk about your brand and how cleverly it makes use of technology. This, I believe, is how new ideas should complement the word-of-mouth effect. Small business branding and advertising through the eyes of a copywriter. I think QR Codes are a fantastic way to make it easy for the consumer to take an action quickly. But as Jeff suggests – that action or destination better be worth it. I work in a fundraising agency and we have recently used a QR Code in a UNICEF UK ad to trigger an SMS with the keyword pre populated – all the potential supporter has to do is press send. Simple. Thanks for the brilliant post. Good post. I agree that QR. Codes are just a fad at the moment, because of the dozen or so that I’ve scanned they all lead me somewhere dissapointing. Something unique or meaningful behind the code would really improve my experience and I would remember the brand that took the time to make it work well. Marketers caught up on the novelty of a new concept is nothing new and in fairness, some things need to be done as wrong as they are done well in order to recognize the difference. I’d toss social media and mobile marketing (the “outreach” side of it, as opposed to QR codes being the “interactive” side, for lack of better terms) into the same mix. Since when did Central Park become “World Park”. I love the creativity in using the QR codes to create a memorable customer experience (Royal London Parks will be being sent this post) but was quite befuddled by the ‘world park’ branding. I love QR codes – a alternative yet simple call to action. The issue should not be with the CTA (as long as it’s relevant to the audience) – but with the quality and appropriateness of the destination. That applies whether it’s a phone number to a call centre or a QR code linking to a website. QR codes seem to be the new bright shiny thing distracting marketing folks. The discussions I have had with my digital agency have focused on the rate of adoption by our target audience (relatively low) and what type of content would our consumers want to see on the other end of a QR code. If all we are doing is providing a shortcut to our website (or a recipe, contest, etc), it is a waste of the consumer’s time and potentially detrimental to the relationship we have with them. If we are able to provide content in a context that makes the overall experience better (such as the Central Park example above), then it would be a huge win. One of the best uses I have personally seen is QR codes on Best Buy’s shelf tags. When scanned, the code takes you the page on Best Buy’s mobile site where you can see more specs, ratings and comments for the item you are looking for. 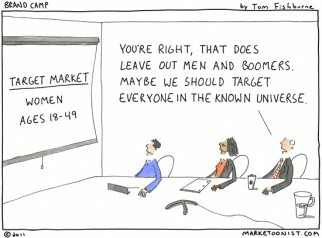 This is much better than having an underinformed salesperson lurking. Of course I scanned the code to see where it took me. Typing this from my android phone. My experience so far with QR codes has been disappointing. I just don’t seem to have seen one that has made me go ‘Wow!’ or been that breakthrough idea where they are really adding value or improving the customer experience. A recent example comes from a poster I saw in London which I presume was advertising a band’s new album. I say ‘I presume’ as all that was there was the band’s name and then a massive QR code which, in normal music marketing, would be replaced with a picture of the album cover or the band itself (the skinnier the jeans the better) with various comments and star ratings. I rather cynically assumed that the brands marketer thought, “Hey, you know what? Mostly kids and teens like this band and they are cool and down with new tech, let’s just whack a great QR code on the poster and that will be ground breaking”. No it wasn’t in my opinion. I have no idea what band’s poster I am talking about, whether they have a new album or a new tour and I have no idea what message they were trying to spread other than “We’re not trying to talk to you”. Had I been able to scan and use the code there and then I could report back on whether they had done something clever, useful, fun or new with the QR code – maybe a free download of an album track (is that innovative?). Alas, when I say I was in London more specifically I was on the Tube so I had no network coverage to find out there and then and wasn’t moved enough to save it for later. Admittedly I may not have been the target audience for the band. However, at best it was a strange piece of advertising placement (how many people really stopped on a busy tube platform to take a picture of the code to save for later?) and at worst it excluded a large part of an audience. It only really proved that QR codes are popping up everywhere and often where they aren’t really the right tool. I’m still interested in QR codes and looking forward to the one that blows me away. 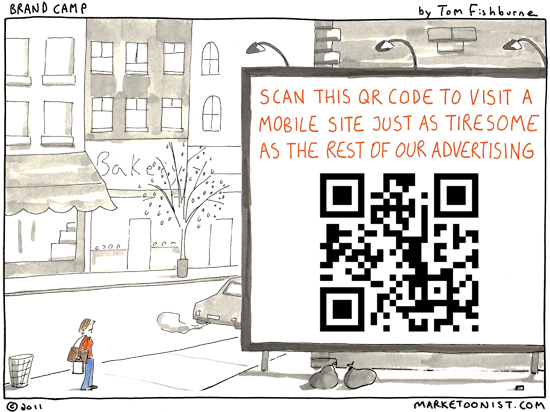 Golden rule of QR codes – have them link to content that is optimized for the mobile device screen, not just your regular website … Tom, great cartoon but the site looks awfully small on a teeny BlackBerry screen! Hi Shreek, I use a pretty good mobile theme for iPhone, but your comment made me realize I never checked it on blackberry. I’ll email you separately to see if you could email me a screenshot, so I can work on legibility in my next web facelift… Thanks for letting me know! The key to QR codes is to remember that they should provide a convenience to the consumer, not the marketer. They should be a way for for consumers to easily access information, discounts, entertainment, or make a purchase, not to link to the 60 second video that explains the rest of your message that you couldn’t edit down to a print ad. If they prove to have value to consumers, they will be more than a fad, but rather the beginning of connecting the “meatspace” to the online world in a more direct manner than ever before. If it is viewed as a gimmick by consumers, then that is all it will be. I am always suprised at the ones I see in TV commercials. 1) because of how quickly it typically passes on screen 2) because the viewer would have to have their phone on hand, right near the TV, waiting for just the right moment to scan 3) it seems to distract (me, at least) from the message actually being shared. Or maybe I’m just too busy searching for my phone. Your post caused me to investigate and install this technology that I had previously ignored for all the reasons you cite. I am unlikely to use the QR software anytime soon for all the reasons you mention, but I am glad I am prepared in case I go to Central Park or some other interesting use pops up – so thanks for prompting me and preparing me! QR codes may be a fad, but smart phones are getting smarter (there’s an ap for that). This is just one more way to engage smart phone users. I wonder if an early human ever figured out that if his cave had the biggest hole he’d get the most visitors. And I wonder if the early human who had the most delicious food smells coming from his cave actually had the most visitors. Once again, another sharp insight. Mobile is and will be an important communications channel and platform for marketers. You correctly point out that it’s the activation that’s key as opposed to just the communication medium by itself. 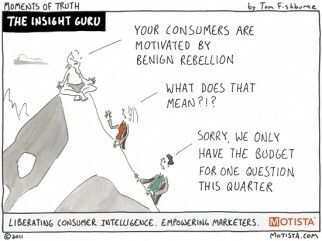 This reminds me of your recent cartoon about marketing briefs. 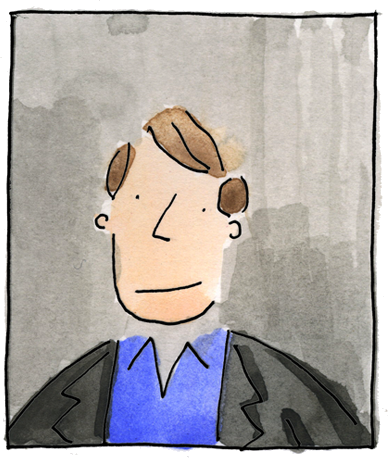 Marketers need to have a plan (first) and figure out the best way to execute it (second). Then, marketers can take advantage of cool tactical and channel marketing options like QR Codes, etc. I’m currently seeing many companies providing QR codes which simply to go the homepage on their website. I recently scanned a QR code for sweepstakes and discovered that the website wasn’t mobile optimized. IMO this is all about transactional optimization. That is, given the form factor limitations of a smartphone how can I help a customer get as far as possible into a interaction so they can easily complete the process in as few steps as possible? Let’s use a faux company named Grand Clips as an example. If I’ve got a QR code displayed on an ad in the store window, when a (potential) customer scans it then I should provide them an appropriately branded mobile-optimized webpage with specials, store hours, and the next available hair appointments automatically. I know the exact store location since they’re scanning the QR code from a specific store window, so at that point I can give the customer relevant information which could improve the conversion funnel. I find QR codes mind-bendingly hideous. Am I the only one to get angry while looking at them? I mean this seriously. Equally, I have yet to experience a heightened personal marketing experience from their existence. If they looked better, I know there are creative applications for them that I would wholeheartedly endorse. QR codes are one of a long list of fantastic ideas with enormous potential that is co-opted by unimaginative, bandwagon-riding, short-sighted drones. The technology is exciting, but the execution is compromised when no one considers the customer experience. When the code simply takes the customer to the same item online, or fails to offer anything for the effort, the message is, “Don’t waste your time with our QR codes, because we completely phoned it in so we can tell our bosses we’ve done it.” This year’s “viral marketing” or “social” or “mobile”, QR codes offer great opportunity I expect to be done well with rarity. Just did a bunch of research on how to manage these (QC) and now they are everywhere. I’m sick of ’em already! Just gave a presentation to our local Association of Realtors on this exact problem/opportunity. Your strip sums it up beautifully. I really enjoyed reading each of the comments this week. I’m glad this topic struck such a chord and I was amazed by the sharp insights and appreciate your bringing it to life with specific case studies: UNICEF, Royal London Parks, Best Buy, Band Poster on the London Underground. This week’s cartoon print goes to Jeff for kicking it off the discussion so well with the concept of “circulation value”. Where a QR code takes you has to be amazing enough to circulate and tell others. The experience needs to be thought through from the eyes of the consumer (not on the subway where’s no Internet access, optimized for mobile, not just a link to the home page, etc). But for real “circulation value” so that it breaks through the mediocre clutter of other QR codes, it needs to be unique and worth the effort. For those marketers that put in that time, the potential is pretty cool (provided consumers haven’t been too discouraged by mediocre examples to adopt it). Great cartoon, Tom. Late to the commenting, but as a marketer, I’m not convinced that this isn’t the ultimate echo chamber shiny object. Lots of us talking to each other. I did a quick informal poll in a marketing group I’m part of asking how many people had scanned a QR code for “personal, not professional curiosity reasons” in the past month. Just 2 in a room of 20 people. I’ll add to some of the case studies here – one of the best examples I have seen shows the potential in the b2b space by using codes on complex, multi-part products like an air conditioning unit. A technician could scan the code to gain access to part numbers, install manuals, recall notices, etc on that exact unit. The takeaway for me is that one way a QR code can be effective when it delivers info or entertainment that it would take me multiple searches, clicks, phone calls to find. You’ll notice though that the code here links back to this post. I was almost crushed inside the post-modern-tech-love-design-loathe whirlpool.